In 2010 I was beginning to take on client work creating WordPress web sites when I was diagnosed with ovarian cancer. Ironically, at 43 years old I was more fit and healthy than I had ever been in my entire life. I had been running road marathons and trail ultra marathons for a few years leading up to my diagnosis. Good thing too, because surgery and treatment were obviously very tough. I was transitioning my design studio from analog to digital. Previously, I was working as a professional artist and illustrator creating commission portraiture and college mascot illustrations with some moderate successes. My background is in Fine Art and Design. I studied Drawing, Sculpture, & Time Arts. (2D, 3D & 4D – 4D can be described as: Length, width, height, and time/ motion) Naturally, as a Time Arts artist/illustrator I love the web! I love designing for the web and mobile too. Web work is immediately gratifying. I do design for both the web and print but I have always felt drawn to the web as it is more accessible, more fluid, dynamic, interconnected, animated, media rich, and well … if you are reading this then you already get the picture. To get through treatment it was important to me that I still work every day. Some days it was just a couple hours in the afternoon but it really helped me to cope and endure unplanned surgery and many painful chemotherapy treatments. I had recently completed a couple of websites with the help of my mentor Jerry Turk. Those sites had good reach. I mean they were the kind of sites that groups of people used and managed so I got some attention for the work and word of mouth spread locally. SVG animations. After surgery, in February of 2017 I completed 18 rounds of chemotherapy treatments. I have survived and am cancer free once again! While going through treatment the second time I was not really focused on what good thing will I be able to grow towards professionally. Honestly, when you go through these things in life – you just spend your energy getting through as best as you can. I think it is worth noting here that while a positive attitude is great and it can improve a patient’s overall experience. Please don’t tell people they will survive cancer because of their positive attitude. Cancer is horrible, it does not discriminate and when people can’t beat a disease with their mental attitude they end up blaming themselves unnecessarily. That is not good. That is not what people intend when then try to offer support in that way but that is something I wanted to share. Now I have landed on the other side of treatment again and as I reflect, it’s been a really epic year! Our WordPress community has been open and supportive, welcoming me at conferences, online, and in slack groups, whether I had hair, energy, or resources – always welcoming and always encouraging. Over the years I have made some wonderful friends through WordPress! Some of us have been at this for a long time and we now have many shared experiences and skills. Having survived again, and having been inspired at PressNomics in Tucson last spring, I’m busy launching a mobile product/service with my team Dr. Kendra Remington and Rita Best called Docs With Apps. I love SVG animation work so in 2018 I’m overjoyed to be doing more contracted SVG animation work with my collaborator Jackie D’Elia. Hit us up!! These are some very wonderful times in technology and within the Internet of things. I feel very grateful to have been able to ride the digital wave into the present and future. At WCUS in Nashville I began the process of contributing to make WordPress after having spent many years empowering others with it. When I was young I needed a way to get my portfolio on line and that is how I got started. Thank you for the opportunity to share my story, to publicly thank my husband Dominic, my family, and friends too. The future is going to be awesome! Take care of yourself and of each other, it’s very important. 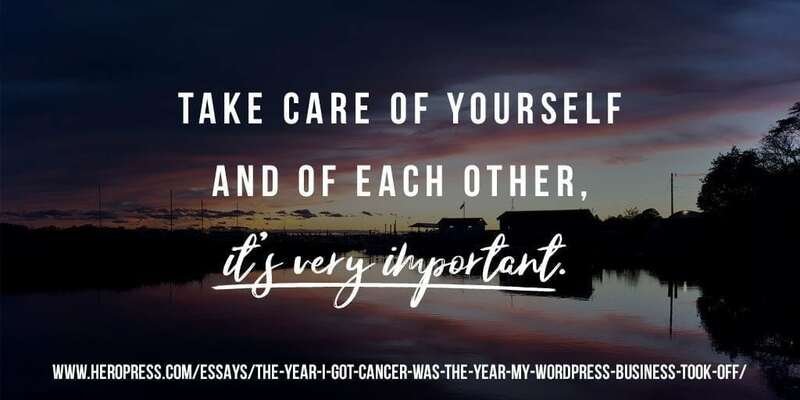 The post The Year I Got Cancer Was The Year My WordPress Business Took Off appeared first on HeroPress.